Published 7/5/2011 . Last updated 3/29/2019 . Prior to making sweet and salty roasted chickpeas (garbanzo beans), chickpeas did not entice me at snack time. I didn’t search the pantry saying, “Chocolate, nah! Graham cracker, no thanks. Oooh, I know what I should have: chickpeas!” Silly me! I now realize that with minimal effort, some sugar, a small amount of oil, spices, and salt, a can of chickpeas can turn into a grazing food akin in addictiveness and crunching pleasure to popcorn. Hop on board the chickpea choo choo (I’m picturing a train with chickpeas flying out of the engine instead of smoke) and give these a go! If you’re already along for the ride, I’d love to hear what spices you use. 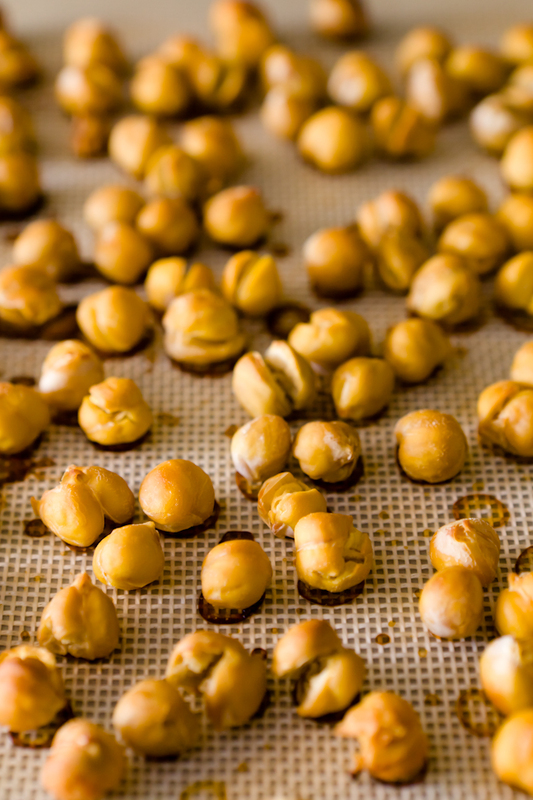 This is chickpea recipe is so simple, but you do need a cookie sheet. Chicago Metallic makes my favorite cookie sheet. You absolutely do not need a Silpat, but my life hasn’t been the same since I bought one. No more buying rolls of parchment paper or trying to scrub cookie sheets clean. Don’t forget that chickpeas and garbanzo beans are the same thing. Your can will look something like this. 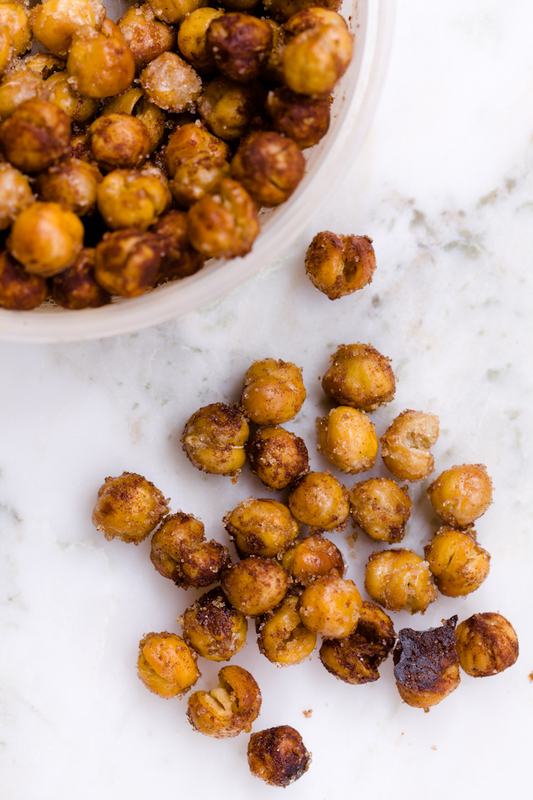 If you don’t want to take them time to make these but still want to try something similiar, you can buy pre-made chickpea snacks. This brand makes them in a variety of flavors. I now realize that with minimal effort, some sugar, a small amount of oil, spices, and salt, a can of chickpeas can turn into a grazing food akin in addictiveness and crunching pleasure to popcorn.